During the summer of 2008, while at an art market, I asked dozens of people to participate in the creation of future work of art. I promised them that, if they would bend a piece of copper for me, I would use it in one of a series of works of art exactly in the shape they gave it to me. 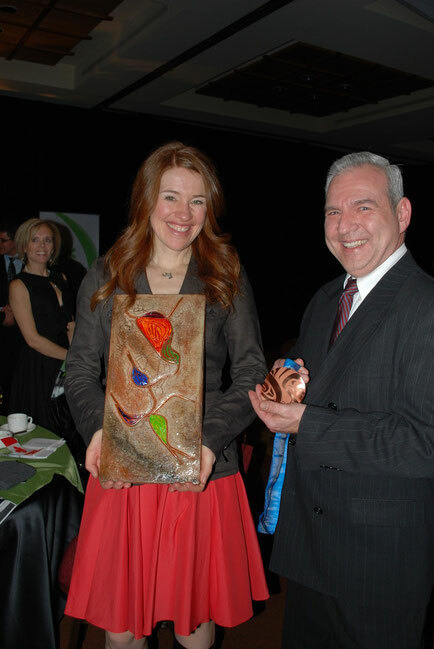 Then I saw, on the front page of the March 11, 2010 newspaper, that Clara Hughes was going to replace Rex Murphy as a guest speaker for a fund-raising event organized by the Boys and Girls Club of Moncton. Right then and there, I realized why I had made this series of works of art. Since many people from this area participated in its creation, it seemed appropriate that I would offer Clara my creation as an artistic proxy for the citizens of Moncton. Additionally, I could hardly think of anyone more deserving of my humble gift. I approached the organizers of the event with my idea of giving Clara one of my creations. They thought it was a fantastic idea and they even gave me the honor of doing it personally. After her ovation producing address, I went up on stage and offered my gift and exchanged hugs… I, an artiste, received a hug from the world's only multi-Olympic medal winner to win in both summer and winter Olympics. WOW!!! I couldn't conclude this entry without telling you how Clara Hughes is so much more than the worldfamous cyclist/speed skater that she is. She is very active with several youth oriented organizations, here and abroad. I encourage you to visit her website, www.clara-hughes.com where you can see for yourself the many wonderful things Clara does outside of the sports arena. During her address, she helped us realize that reaching our personal best performance is much more important than attaining some elusive goal. Throughout her career, she has given us the best example possible; that of passionately doing her personal best in all areas of life. This was definitely one of the most memorable events of my life. I am honored to have met her, and even more so that she has accepted my gift. Clara, wherever you are, keep doing what you're doing as the world definitely needs to hear your message.